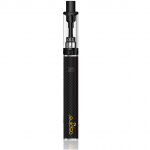 The K2 from Aspire is an economic and convenient tobacco alternative. The K2 brings you an open source tank and battery system that is reusable and rechargeable and best of all the K2’s tank is refillable. So you’re never limited when it comes to flavor,a black battery with the black tank and the pink battery with the silver tank! Kit includes: Battery, the tank, and one preinstalled atomizer, an extra replacement atomizer,as well as a microusb cable for charging.